For nearly 1,100 contests, spanning 15 NHL seasons, Philadelphia’s Kimmo Timonen has been one of hockey’s steadiest defencemen. And at age 39, he’s still got plenty of game. He was hardly seen as a slam dunk for success at hockey’s top level. Small, at least in comparison to his fellow players, the 5’10”, 195-pound Timonen was a late-round selection, taken 250th overall by Los Angeles in 1993. How would the Finnish native, who was traded to Nashville on June 26, 1998, fare against the best in the sport? While it admittedly took time for Timonen to hit his best stride, the diminutive defenceman became a talented two-way threat, a capable point-producer who was equally proficient in his own end. 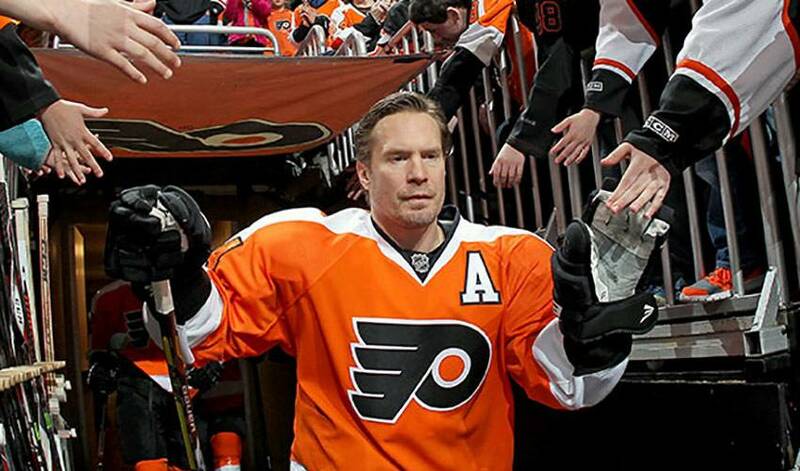 But it was hockey that occupied most of Timonen’s time and thoughts. Eventually, it led him to North America, to take a shot at the NHL. After a 29-game stint with Milwaukee of the International Hockey League in 1998-99, Timonen was called up by Nashville. He made his NHL debut on December 16, 1998, versus Anaheim. Timonen, who played for Finland in three World Junior Championships (1993-95) might have missed the IHL All-Star Game due to the call-up, but the defenceman didn’t miss a beat when it came to his game. His rookie campaign, one in which he led all Nashville rookies with 12 points and posted a four-game point streak, was full of positives, including Kimmo’s ability to make things happen in both zones. Boosting his point total by 21 in his sophomore season, Timonen looked more and more at home on the smaller North American ice surfaces, taking on more responsibility and ice time with ease. He was named captain of the Predators for the 2006-07 season, and in a drastic turn of events, traded one season later to the Flyers, where he is remains as a key piece of their lineup, serving as an alternate captain. With four Olympic medals (three bronze, one silver) and three World Championship medals (all silver), Timonen, who co-owns his hometown team, Kalevan Pallo (KalPa), has experienced an abundance of success on both NHL ice and the international scene. He skated in his 1,000th NHL game on March 18, 2013.